Hikes under 10 miles for a day's adventure. Mostly level hike. Walk from Gissen's Photography Studio in Cazenovia along forested abandoned lehigh Valley RR bed, along scenic Chittenango Creek. Easy with only one steep bank. Constine Bridge Road to Hardscrabble Road. 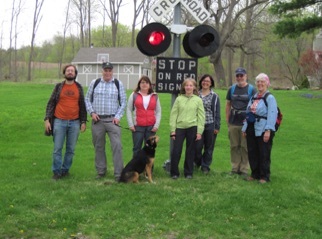 The Link Trail/NCNST follows an old railbed through a mixed cedar and hemlock forest and then crosses a footbridge over Chittenango Creek. Grassland/low bushes offer wildflowers and bird watching. After a second wooded section, follow hedgerows/fields to Hardscrabble Road. Also, the Department of Environmental Conservation (DEC) has built and maintains an Interpretive Loop Trail (.7 mi), handicapped accissible. From Constine Bridge Road trailhead, follow Link Trail/NCNST to begin the Loop Trail through cedar and hemlock forest along Chittenango Creek and alongside a meadow before looping back to the NCNST/Link Trail. Easy to moderate hiking. Find the blue blazes of the Link Trail/NCNST near the parking area at the top of the hill. Follow the blue blazes west and north through woods, beside a small stream, through hedgerows with short open spaces, and into a mixed hemlock/hardwoods grove out to trailhead parking on Chenango Street at the edge of Cazenovia village. Car parking is available at both sites. Also, SQHAP appreciates a donation from non-members. Mostly level hiking except for one short, steep downhill and a climb up a 72-step stairway. One of the newest sections of the Link Trail/NCNST on an abandoned railbed with valley views, creek and wetlands on both sides of the trail; continue through a scenic ravine with views of Canastota Creek. Climb out of the ravine via a stairway and continue through hardwoods.